At Heaven Chemical, your satisfaction is core to our purpose. We are Hygiene and Cleaning Chemical Manufacture. We have an exponential impact on the sustainability of our planet. Heaven Chemical provides a Environmentally friendly Product. Our product suitable for Comercial Laundry, Industrial Laundry, Hotel dan Hospital. 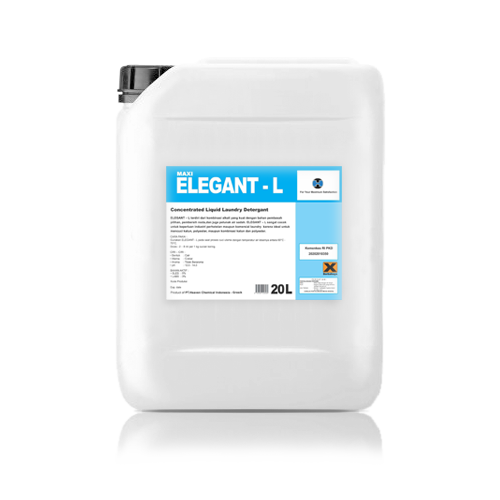 ELEGANT – L consists of strong alkalis combined within a complex matrix of biodegradable wetting agents, soil suspending agents and water conditioners. ELEGANT-L is ideal for washing institutional and commercial classifications of cottons and polyester / cotton blends making it an ideal product for all commercial and hotel laundries. 100 % active concentration mean only low dosages are required. Powerful wash matrix will remove a wide variety of organic soil. Contains soil anti redepotition agents which remove graying scum from the water. Special optical brighteners ensures a brilliant finish to whites and colors. Effective over a range of “working” temperatures. Performs effectively in all water conditions. Brightens both white and colored fabrics. • Apply REAGANS in the suds cycle of a wash program or Break cycle / Prewash of a wash program. EXON – L is an oxygen bleach that is safe for a color and white linen or cloth. EXON – L will effectively to remove all kinds of tough stains and contain of brightener that keeps the linen’s color bright. Can be use in a washing process so it will safe the washing time. Completely miscible in minimal temperature 60°C. As a guideline, EXON – L is used at between 3 – 6 ml per 1 kg of dry load, at an optimal temperature of 55°C – 70°C. Concentration depends on the level of soil encountered and the type of linen being washed. BLITZ – L is formulated to remove tough stains from white linen. Its stabilized chlorine is set at an alkali pH which will remove a wide variety of organic stains including egg, Soya, sauce, coffee and tea. BLITZ–L is ideal for washing white F & B linen, bed sheets, pillow cases and face towels. As a guideline, BLITZ – L is used at between 1 – 3 ml per 1 kg of dry load, at an optimal temperature of 55°C – 60°C Concentration depends on the level of soil encountered and the type of linen being washed. BALANCE – L is designed to neutralize excess alkali and chlorine carryover from the main detergent and chlorine bleach. Introducing BALANCE – L into the laundry process helps to reduce the number of rinses required to return linen to a pH of 7.This saves on time and water. Concentrated BALANCE – L further assists in reducing yellowing caused by presence of iron in the water. Suitable for all classification of colored and white fabrics and prevent fabrics from discoloring. Inhibits the development of rust stains and yellowing of fabric. Non- corrosive to laundry equipments. At the last final rinse of the laundry cycle with the dosage : 1 – 3 ml for a 1 kg dry cloths. Those dosage is depends on the water condition. Softeners are essential element in any laundry washing program. While the obvious function is to provide soft linen which will not scratch when used. Such properties are important as VISOFT is able to assist in reducing the drying time required, especially in the case of towels. Provides excellent softening for both organic and synthetic fibers. Rapid solubility in cold or hot water. Provides stain resistance to linen. Saves time and energy as it decreases extraction and tumbling time. 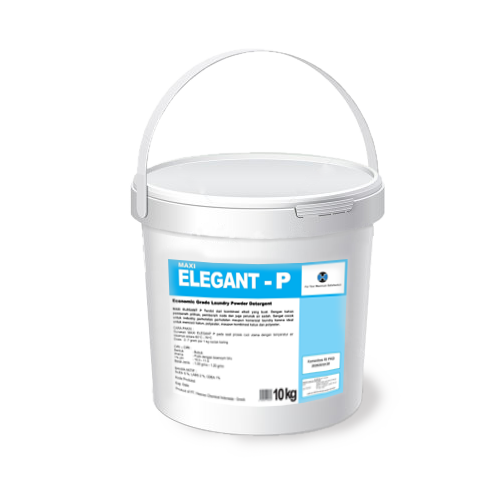 100 % active, ELEGANT was developed to provide superior cleaning at an economical price. ELEGANT is able to remove most light soils from a variety of linen, including synthetic fabrics. It’s synergistic combination of non – ionic and anionic surfactants ensures no soap scum formation, while special optical dyes will provide the required brightened finish. ELEGANT is an ideal product for washing all kind of linen and clothes. HARMONY consist of strong alkalis combined within a complex matrix of biodegradable wetting agents, soil suspending agents and water conditioners. HARMONY is ideal for washing institutional and commercial classifications of cottons and polyester / cotton blends making it an ideal product for all commercial and hotel laundries. BLITZ – P is formulated to remove tough stains from white linen. Its stabilized chlorine is set at an alkali pH which will remove a wide variety of organic stains including egg, Soya, sauce, coffee and tea. BLITZ – P is ideal for washing white F & B linen, bed sheets, pillow cases and face towels. As a guideline, BLITZ – P is used at between 1 – 3 gram per 1 kg of dry load, at an optimal temperature of 55°C – 60°C concentration depends on the level of soil encountered and the type of linen being washed. BALANCE is designed to neutralize excess alkali and chlorine carryover from the main detergent and chlorine bleach. Introducing BALANCE into the laundry process helps to reduce the number of rinses required to return linen to a pH of 7.This saves on time and water. Concentrated BALANCE further assists in reducing yellowing caused by presence of iron in the water. At the last final rinse of the laundry cycle with the dosage : 1 – 3 gram for a 1 kg dry cloth. Those dosage is depends on the water condition.